Recurrence of Number 54 in your life shows that ministering angels are advising you to make a list of your beliefs and ambitions, and arrange them based on the importance of these ideas and objectives. This will enable you to make basic alterations which are in line with your spiritual targets and the goals in life. Angel Number 54 is suggesting to you that whatever alterations you make will result in fresh openings for magnificent development of all aspects of life, and you will be able to widen the horizon of life. You will have the grace from the angel numbers and Supreme Power. They will provide you with the necessary intelligence and skills to achieve your spiritual goals and targets in life without any difficulty. By mixing the characteristics of Number 5 and Number 4, you obtain the traits of angel number 54. Number 5 represents the wisdom gained in life while facing the obstacles and making suitable alterations in life based on your experiences. The number also refers to creating proper methods in life, right thoughts and interest in those ideas, bravery and inspiration, flexibility and diversity. The Number 4 has the vibrations of fortitude and tolerance, creations based on strong groundwork. Other qualities of number 4 happen to be strong beliefs and precedence, loyalty and trustworthiness. Number 4 is indicative of enthusiasm and vigor in your actions. Angel Number 54 is a communication from the angels that your devotion and diligence towards realizing your desires and ambitions and your optimistic assertions and hopes will provide you with favorable prospects and incentives. These openings will bring major transformations in your life and your life will change for the better in all respects. 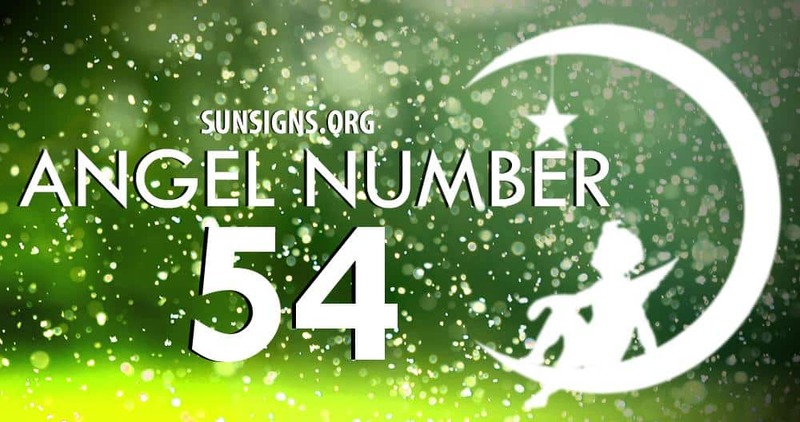 Angel Number 54 is a reaffirmation from the angels that while you are making important alterations in life, they are with you to cheer you, assist you and direct you throughout the journey.